Our first summer trip each year is to the Bainbridge Island Rotary Auction where we dream of all the goodies we can score at this massive yard sale that covers an entire elementary school. In the past we've stayed at hotels. This year we stayed in an Airbnb.com place called Sacred Groves. They had an affordable yurt available that was amidst a very wooded area. The boys loved that there was a trampoline to jump on. We loved that it was cheap and close to the Rotary Auction. We arrived on a Friday and headed to the auction preview. After that we went over to the Glasby's house to have dinner. They are always so kind and gracious when we come. They made us a wonderful meal and dessert and really went all out to make us feel welcome. Our boys had a blast playing with their kids. We scored a few finds at the auction...educational software for the boys, a cutco knife block, etc. No major huge items, which is a good thing. Sometimes I think the hunt is more fun than the actual find. 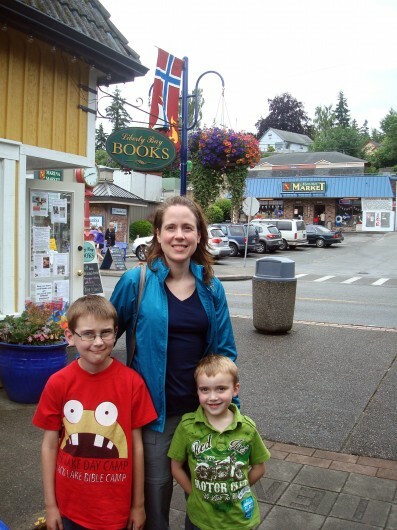 The day we left we headed to Poulsbo to go to Sluys bakery and shop the little Norwegian town. We love it there and miss that area of WA State.